Well we are back at Doomben again this weekend – seems as if this track is like the Pacific Highway and is used 24/7 – something will have to give soon! The weather men are saying there will be warm and fine conditions. The track is rated “GOOD” (Friday morning) and the rail will be out 7.5 metres the entire course this weekend. After watching the races last weekend, it appeared horses that raced on the speed were in favour – this may be the tempo of racing this weekend. Brisbane bookmaker Con Searle has set up his stand up at Doomben this weekend for Concessional betting! You would have read the story on HRO in David Fowler’s weekly column some weeks ago! Well this weekend it goes live – Concessional Betting at Doomben – Con Searle watch out WINNO is coming for you! The racing industry is divided on Chautauqua and his reluctance to race and leave the stalls in barrier trials. He is a wonderful sprinter. Maybe he has had enough, maybe he has not – people say it is a sign that he does not want to race. My view on it is that he has been too much of a wonderful ambassador and advertisement for racing not to give him some more time to see what is going on. The pundits may be right. He may just be over racing, but the way he worked when Tommy Berry got him out of the barrier and galloped around the track looked like the Chautauqua of old. We permit our athletes time to recover and mend and let them have a chance at comeback. I think he deserves the same liberty. The Hawkes team are not silly I am certain that if they can get him to switch on we will see him back racing. As you all know I have been in Darwin for their Annual Cup Carnival and the feature races The Palmerston Sprint and Darwin Cup. I must say that race clubs could learn something from this Club on how to cater for big days like this. Marquees for Corporates and for the once a year race attendee in the centre of the track was booked out and packed weeks before the massive Darwin Cup Day program. The layout, the access and ease of patrons obtaining food and drink was amazing with patrons walking away more than satisfied. Even some first-time race goers asking the Club where can we sign and pay for next year! Innovation and creativity will bring people to the races – Darwin Turf Club take a bow! I have been busy over the last week with some 60 seconds interviews – do you have the kahunas to go 60 seconds with WINNO – let me know! A small field to start off the day of racing with a few runners who like to lead. Jadentom (5) from the Lindsay Hatch team resumed at Townsville and won racing off the speed and coming home over the top of them. Normally this mare will take up the running – maybe she will lead this weekend with Brad Stewart in the saddle. Tony Gollan has two runners engaged here, My Girl Hayley (2) and Shesees Everything (9). Last start My Girl Hayley (2) sat behind the speedy Spurcraft and didn’t make up any ground. This weekend she may lead as she is drawn handy in barrier 3. Shesees Everything (9) likes the speed on in her races and she will settle off them and make a run late. I think the race will be set up for her this weekend and third up she will be suited in this field.Matthew McGillivray stays aboard the Star Witness mare – I like her to kick off the program this weekend. The new three-year old’s step out here for the first time. Ef Troop (1), another Tony Gollan runner, resumes from a spell and must carry 60 kilograms here over the 1110 metres. Look he is a class runner and his barrier trial with Brad Stewart two weeks ago was sensational. He looks like he has come back ready for a nice preparation. He is $1.60 favourite and deserves to be that price. He will probably win the race – however, I have looked for some value and found one that may just pip him this weekend. Robert Heathcote trains Pinch Memory (4), who also won a recent trial and has blinkers on for the first time. I think at the $6 he represents wonderful value and with the claim for Taylor Marshall he gets 7.5 kilograms off Ef Troop. Could this be the deciding factor? It looks like a nice quinella – I will be backing the Heathcote runner! As for the other placing – Aileach (2) from the Rex Lipp stables is undefeated in two career race starts and, despite winning all her starts on heavy tracks, should transition nicely to weekend company. Wow a weak Open Handicap over 1350 metres features here. The field has been decimated by some early scratchings as well. I think I will be eating lunch about now – this race is very hard! Time To Torque (7) resumed last weekend and raced home well over an unsuitable distance. This week on a short back up he gets to race over 1350 metres which is probably more appropriate. Gary Doughty may get his first city winner! Michael Cahill stays aboard. There has been some support for the Brian Smith trained Order Again (2) who has had five weeks between runs. He normally races well with his runs spaced out. Larry Cassidy is looking to break a run of outs when he is legged aboard this runner. He does get back and will race home late. The likely leader here is the Kelly Schweida trained Stella Ombra (4) who just has had no luck in recent runs. He could just get out in front with Jim Byrne in the saddle and run them into the ground if left alone in front. I think he would be better suited over 1200 metres with those tactics – however, he is a chance here. The Toby Edmonds runner From Within (11) was put up at $9 in the early markets and has been smashed into $3.10. The mare can race well fresh and can race forward. She won a trial a fortnight ago and has new stable jockey Ryan Maloney in the saddle – maybe it will be a winning local debut this weekend? Mediterranean (6), from the Matthew Dunn yards at Murwillumbah races, well fresh and his recent trial at Ballina suggests that he is forward enough to run a race first up from a spell. Jim Byrne jumps aboard the Smart Missile gelding for the first time. Meet Mr Taylor (7) is making his debut in the city. This Kelly Schweida trained gelding has won at Gatton and then on the Gold Coast and is looking to notch a hat trick of wins here. He has raced on the speed in all his starts and I expect that he will lead this lot this weekend unless Billy Healey decides that I Am Venus (12) should go forward again. Billy trains I Am Venus (12) and has some recent luck with his team starting to fire after a quiet period for the stable.He is a hard-working young man and deserves all the luck that can come his way. I know I pick on him from time to time (well a fair bit actually) but I do have respect for him and the passion he has for his horses and stable. But Billy – please cop the tip from WINNO – can we ride her quiet this weekend and flash home late at them? Please! I am sure that there will be some comment from him once he reads this! She is a nice mare who I think she has some ability. Last start at Ipswich Jimmy Orman led on her and she was run down. I am sure that she will strip fitter and I bet Billy has had her at the beach swimming her – she will be ready this weekend. Watch out punters she is good odds as well at $12. The weekly stayer’s race. I think I may have more luck in picking the winning numbers in next week’s $100 million Powerball to be honest! Rob Heathcote holds the key to this race with his two runners – Ruling Dynasty (3) and Ingeegoodbe (10). Ingeegoodbe (10) has massive wraps on him from the stable. I think that he gets his chance this weekend to return to the winner’s stalls with the claim for Taylor Marshall and the fact that he is fourth up this preparation. I wonder whether we may see a change of tactics this weekend from Heathcote and Marshall in letting him take up the running and leading with only 52.5 kilograms on his back? His stable-mate has been very honest and racing very consistently since coming to the Heathcote stables. Ruling Dynasty (3) should be competitive again in this field and, with Orman remaining aboard, look for an improved effort. The runner that could upset them all is the Chris Waller trained Montauk (1) who raced very well in the Grafton Cup a month ago. He raced on the speed on that occasion and was only beaten around two lengths by the winner First Crush. With a month between runs and a silly price of $12 he may just pop here and cause an upset. The other Waller runner that comes to my attention is Irish Optimism (9) who came out last start and stormed home to win over a mile at $15 to give jockey Michael McNab his first Brisbane, Saturday winner. He has raced well over these longer distances in the past and he will prove hard to hold out again. 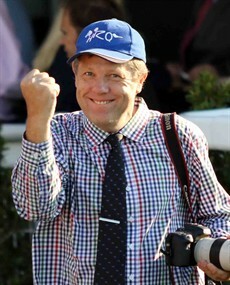 So, in summary, it is Heathcote in the Red Corner – Waller in the Blue corner – may the best stable win! Tabbing (11), for me, gets the nod here. The form around some of his recent efforts has been franked and I think with Jackson “McLovin” Murphy’s 3-kilogram allowance he gets in really well at the weights. Probably with the rail out and with the track maybe having a leader bias as well that draws me to this runner who is around $8 in the markets. Malvern Estate (6) cannot be underestimated as well. This Desleigh Forster trained Redoute’s Choice gelding comes off a solid effort in the 2018 Grafton Ramornie and then a nice effort running home late over an unsuitable 1100 metres to just run out of time to reel in the speedy Spurcraft last start. Stepping back up to the 1200 metres he gets his chance to break back through into the winner’s circle this weekend. Fortensky (3) resumes here from a spell for the Waller stables on the Gold Coast. The barrier trial on 10 July was nothing to write home about but I think he did enough to show me that he will take some benefit from that hit out. He always races well fresh as his record demonstrates with four starts for three wins – another nice ride for Michael McNab. Suspense (8) is trained by the Peter & Paul Snowden team and debuts here in Queensland for the first time this preparation. He has run in some better-quality races and I think he will be trained to the minute by the Snowden’s – but I would just like to see him in the yard before saying he can knock off these other three. A No Metro Win Handicap over the mile greets us for the first leg of the Treble this weekend. I have been tipping Glitra (2) trained by the Peter & Will Hulbert team who have been doing well over the past few weeks. I did not miss Glitra when it saluted in the Coffs Harbour Cup whilst I was in Darwin at $11 – thanks team Hulbert. Oh yes and thanks Matty McGillivray for a great ride! I think he gets in well here again despite the large weight and he will race handy which is his style of racing He should prove hard to beat again. Cedarwood (6) is fourth up here. He was run down late by Pressway (Race 8 number 11) a fortnight ago after hitting the front and looking the winner with Glen Colless aboard. He is not a prolific winner with only two wins from 16 starts but I think that he will again be competitive here in this NMW race. Pleased (9) is trained by Stephen Lee. His stable has been getting some consistent results in recent months since he has moved to the Coast. This gelding is proven over the mile. Last start, in a midweek race, he really had no luck when the rail was out 10 metres and he seemed to be blocked at a vital stage when trying to get out and win the race. Jeffrey Lloyd has been engaged by Lee to ride this Street Cry five-year-old gelding. Contralto (8) was narrowly beaten over the Grafton Carnival over 1400 metres in a nice race. I think that she will appreciate the step up to the mile this weekend and will be coming home late. Pressway (11) won with some authority last start over the mile and comes back in distance to the 1350 metres here. He has been competitive over the shorter distances in the past and has had three weeks between runs so I expect that Steven O’Dea has freshened him up since that last run and will be ready to fire. The stable-mate is Makes You Think (14) to be piloted by Paul Hammersley. This So You Think gelding has been racing in lower grades consistently and I think down in the weights, drawn well in barrier two, he should race on the speed. I think that now he is third up this preparation that he could fire and cause he stable-mate some grief at the finish. Bargannon (8) is trained by David Vandyke on the Sunshine Coast. This four-year-old gelding won last start in a Class 3 event as his home track a fortnight ago and comes to Doomben for the first time. I liked his effort behind Sacred Rebel when he was beaten just over a length in the start prior to that win. Jim Byrne is back aboard this weekend. He has a 100 % strike rate on the gelding riding him twice for two wins. I Am Impinge (13) is from the Edmonds stables on the Gold Coast. I think he goes better over this 1350 metres rather than the mile which he has contested in his last two starts. He is a definite rough chance to blow this lot away. Another runner that’s could pop up at odds is Charlie Cat (2) now trained by Greg Cornish. This gelding is a rogue however, if he ever puts it together on the race course he can do anything including causing an upset at around the $41 mark. Tony Gollan has Courtza King (3) in the race. He seems to have a habit of winning third up – and, guess what, he is third up this weekend with Brad Stewart taking the ride. His run last start when beaten by Armanaat was solid. Well we have made it to the last race – hopefully we are alive in our Quaddies and Trebles and in line for a win! At this stage at Darwin last weekend it was a glorious 30 degrees, the sun shining and the track buzzing! Wonder what it will be at Doomben late in the day. Splitter (9) was a solid run behind Goodonya Sonja last start here a fortnight ago. I think that run sets her up here for a solid performance again. Conquering Lass (7) raced in the same race that weekend and finished a little further down the track, however, this Steve Tregea runner steps up to 1350 metres this weekend and I think will appreciate the further distance. Romney’s Choice (4) won at Grafton in the Mother’s Gift race – they normally have a good record out of this race. Chris Anderson has given her a month between runs and she had a barrier trial on 31 July where she won that over 1000 metres very impressively. I remember him holding that winner’s trophy so proudly above his head at Grafton and him telling me, “this will come back to haunt me” – well this weekend hopefully there is another trophy so we can repeat the effort! Seriously, she is a nice mare that I think she is up to weekend metro company. She looks well placed with the claim for the 2017/18 Brisbane Metro Apprentice jockey winner – Jag Guthmann-Chester! Hingus Rose (3) will race in the lead in this field with apprentice Stephanie Lacy aboard. She can rate them in front and has been riding winners of late. Last start here this Stuart Kendrick mare was beaten by Arena Salon (race 8 – number 1). Benfica Princess (8), from the Kelly Doughty stables, is not without a chance here either if they are making ground. She will normally race at her best ridden off the speed and flashing home – however, she may need to be ridden a little closer here. Either way I am certain jockey Jeff Lloyd will place her perfectly. Looks like it is going to be a battle between Brad Stewart, Taylor Marshall and Matthew McGillivray. It could be a dead heat between all three of them if they retain all their rides – maybe a sneaky bet on Brad Stewart may yield a nice result for us.